Along with the Malthouse flour I was given a few weeks back there was also some French Type 55 Flour. This is a nearly-but-not-completely white flour which is used for making bread in France. It is not as high in gluten as strong English bread flour and some of the wheat germ is retained, giving it a slightly yellow colour. 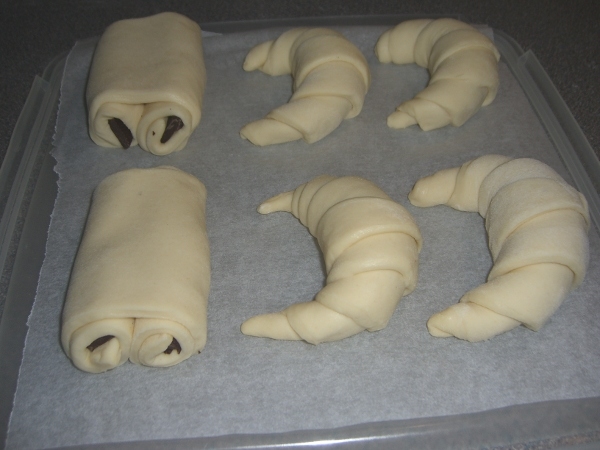 This seemed ideal for trying something I’ve been thinking about for a while: Croissants and Pain au Chocolat using sourdough starter rather than baker’s yeast. In theory everything can be done with sourdough. After all, prior to the 19th Century development of a specialist baker’s yeast, bread was proofed either using the spare yeast from the brewing process, or from sourdough – natural yeasts which grow on the grain and are present in the air around us. Thursday evening: Make the starter culture (I think this would be called a ‘chef’) and leave it on the kitchen counter overnight. This formed a very stiff dough and I think next time I would take some of the recipe water from the second stage and incorporate it to get something a little freer. Friday afternoon: Make the main dough. Absolute minimum of kneading, just get it into a ball really. Also prepare the butter into a 15cm square block. Put both in the fridge overnight. Saturday morning: The recipe says how important it is to have the dough and butter at the same temperature. My opinion is that this doesn’t make sense unless your fridge is pretty warm. I wrapped the butter in the dough as prescribed and the butter was so hard that the dough just squidged around it when I tried to roll or knock it out. I went and had a cup of coffee whilst it softened and then gave it an extra fold. Whilst I agree that it is important not to melt the butter I would remove the butter from the fridge half an hour or more before the dough and let it soften just a tad. Another option would be to roll the dough out larger and slice the butter even thinner with a mandolin or one of those cheese knives that makes thin slivers. Once the butter is sandwiched in the dough it has to be rolled out and folded in three, three times, with a 30 minute fridge rest in between each. This produces a total of 27 layers, although mine got an extra fold so 54 and that didn’t seem to hurt. Then the resulting block is refrigerated until the evening. Saturday evening: clear as large a space on the kitchen counter as possible. If you are going to roll out the entire batch it will stretch out to over a metre long. 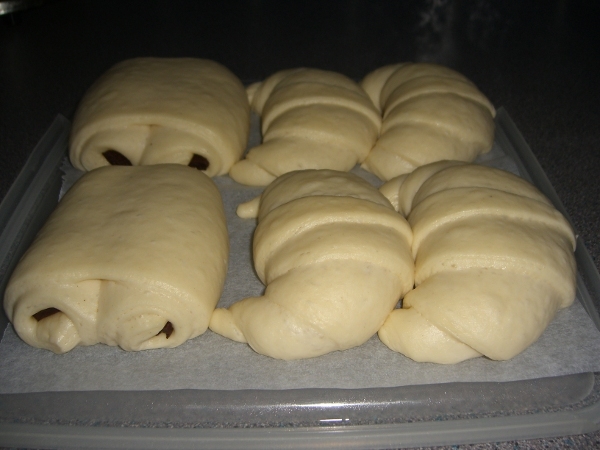 What I chose to do is cut the dough in half and roll it out to 20cm by 55 cm. The other half went back in the fridge for a second batch the following day. I made five croissants and two large pains au chocolat and left them in a tupperware box on the counter overnight to proof. It is February and the kitchen is pretty cool overnight so I think they would have been better with a little more heat. Sunday morning: I popped them in the oven on its lowest setting for half an hour whilst I had breakfast because they looked as though they could do with a bit more rising. I think longer would have been good but I had to go out so that wasn’t an option. Then I removed them whilst I brushed them with egg wash and the oven got up to 220C. The instructions were for 10 minutes at the oven’s highest temperature and then lower to 160C. The theoretical maximum on our oven is 250C but I lowered the initial temperature a bit to 220C. In fact I think that was still too high and for too long and the crust over-browned a little. Second Batch: For the second batch I did what I normally do with my sourdough bread and put them in the oven overnight with just the interior light on. They were also covered by the tupperware box and this was clearly a bit much as they over-proofed to the point of near-collapse. I baked them with the oven set to 200C for 10 mins and then lowered to 170C for 10 mins. This was perfect. This second batch the dough had had even longer to develop in the fridge and the sourdough taste was stronger. For me this really enhanced them, giving an almost lemony taste. The verdict. Warm from the oven the butter content seemed a bit high. The recipe calls for 280g and I think I would lower it to 250g as that’s the size of a pack of butter anyway. In fact when they are cold the greasiness goes away, so it depends on how you are going to eat them. They were light and fluffy inside although perhaps not as puffed up as they might have been if baker’s yeast were used. The taste was great. 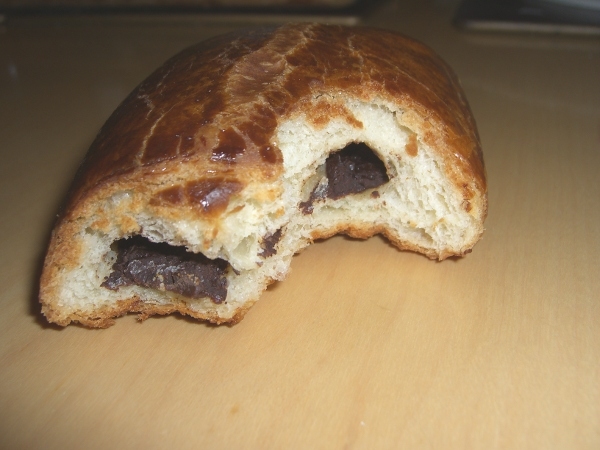 The pain au chocolat should definitely be left until cold so that the chocolate has a chance to set. We tried them in the afternoon and they were absolutely perfect as far as we were concerned. So, worth doing? Yes, absolutely. If I had started on Wednesday evening that would have meant an option for fresh viennoiserie on both Saturday and Sunday mornings. What, short of going to Paris or Vienna for a ball, would be better to brighten up a gloomy February weekend? 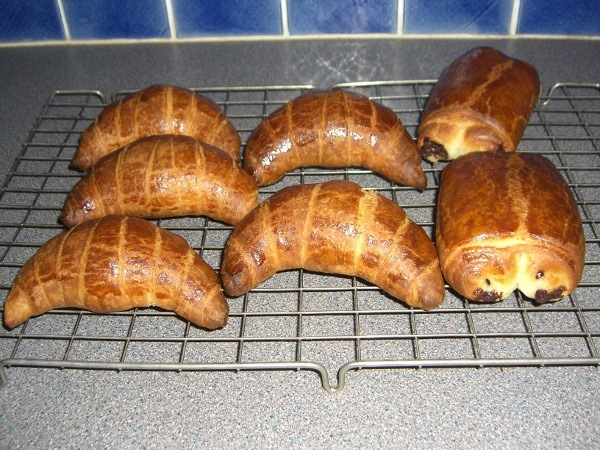 This entry was posted in Food and Cooking and tagged Croissant, Pain au Chocolat, Sourdough, Type 55 Flour. Bookmark the permalink. Those croissants look delicious, feel free to ship some to Mysore. Although sourdough lasts a little longer than baker’s yeast bread I’m not sure it would stand that long a journey. Besides S will know if you have been eating pastries as soon as you get on your mat. Bad man! definitely worth doing! Tempting me to get back to sourdough baking…. Nice croissants Mike. Boris did a good post on how it’s done, but as he’s professional and did it in a nice controlled environment, I’d not been game to try at home. But seeing your results has got me inspired to give it a try. This week I’m going to do some grain bread, but I’m putting the croissants on the agenda. Spooky, we must be connected somehow, I’ve just put a batch of sourdough made with malthouse flour in to bulk ferment. Malthouse has added malted grains of wheat, barley and rye. 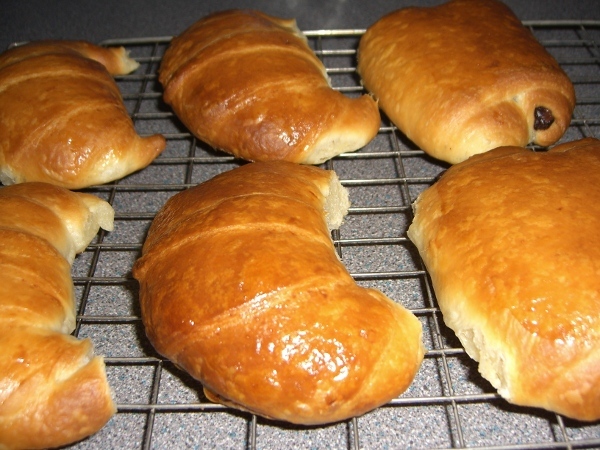 The idea of home-made croissants, fresh and warm from the oven, sounds wonderful and you make it sound relatively easy. 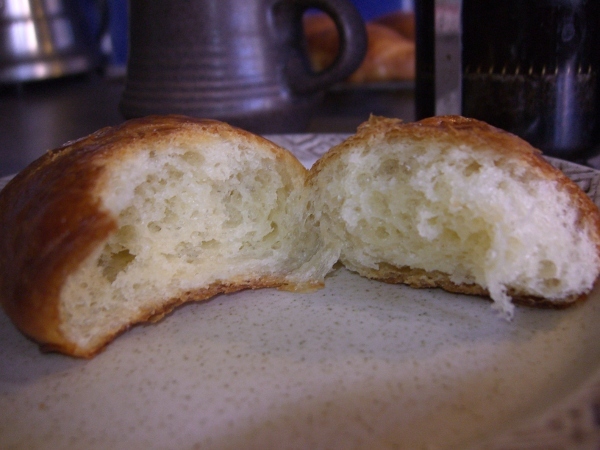 However, since my nearest bakery is only 2 minutes and their croissants are wonderful….. I’ll continue to be lazy. .. and in any case the morning walk to the bakery and the few pleasantries exchanged are part of French life. If I were in your situation I would do the same for sure. It was only that I was given some type 55 French flour – I’ve since tried sourdough baguettes, which were reasonably successful too but I’d like to give that one more go before writing it up.